We are preparing a series of interviews about weighted blankets for you. On the internet, there is very little information about professional usage and knowledge of weighted blankets. That is why we would like to discuss and explore this topic further. The first is an interview with Oligophrenologist and massage therapist -Edyta Tyszkiewicz. What experience do you have in working with children? I am an Oligophrenologist – a therapist, as well as a massage therapist. For over a dozen years, I have been working with children who need pedagogical rehabilitation. Sometimes I conduct group classes in one of the centers of early support, but most often individual classes in the home of a specific child. I have experience in working with children with various developmental, emotional and psychological disorders (including autism, MPD, Edwards syndrome, ADHD and others). When was the first time that you heard of a weighted blanket? Who do you recommend weighted blankets for? I recommend weighted blankets to children with various types of disorders, as a support for pedagogical therapy, to stimulate the proprioceptive system, i.e. deep sensation. It is very helpful for relieving tension in children with ADHD and other hyperactivity disorders; as well as, autism, Down syndrome, Rett syndrome, cerebral palsy, attention deficit disorder, attacks of aggression and anger, impaired motor coordination, poor mobility, motion sickness, self-care difficulties, speech delay, speech impairments, tactile hypersensitivity (e.g. manual difficulties), or in situations that require silencing and calming down a child. I also recommend the use of these blankets for premature babies, children born via a caesarean section. In addition, people with depressive disorders can benefit from the use of a weighted blanket. What positive effects do you think the use of a weighted blanket can provide? The pressure of the quilt increases the child’s body awareness, soothes anxiety, and improves concentration and attention. In addition, it helps a child calm down, relax, and reduces auto stimulatory behaviors, while reducing feelings of anxiety. As a massage therapist, I can say that the even pressure provided by the weighted blanket uses the same type of stimulation as many kinds of massage techniques, allowing the child to calm down and “put together thoughts.” The deep pressure in my opinion is conducive to the production of neurotransmitters, including serotonin, known as the happiness hormone, improving a child’s mood, relieving pain, which relaxes the child. In your career, who was the most extreme case that you recommended a weighted blanket for? The most severe case in which I recommended using a weighted for, was Klaudia – 3 years old. The girl was diagnosed with microcephaly, drug resistant epilepsy, severe hemiparesis, a cleft palate, low set ears, mandibular retraction, an umbilical hernia, ASD heart defect, increased muscular tension, an enlarged right kidney, delay in psychomotor development. Klaudia was born at 38 weeks through caesarean section with a birth weight of 1530g and 41cm in length. At five months she had a PEG (feeding tube) placed. At present, she has increased muscle tension, and a soft larynx. For a long time I wondered, together with other specialists, whether Klaudia could use a weighted blanket. In my opinion, the fact that she was born via caesarean section and increased muscular tension made her a possible candidate for needing a weighted blanket. Because there is little reliable information on the use of a weighted blanket in extreme cases, I was not sure if the blanket would interfere with her existing conditions or the PEG for that matter. Together with Klaudia’s mother, we decided that we would try to use a weighted blanket as part of her rehabilitation therapy. On the day that the weighted blanket arrived, Klaudia had already had twenty epileptic seizures earlier that day. 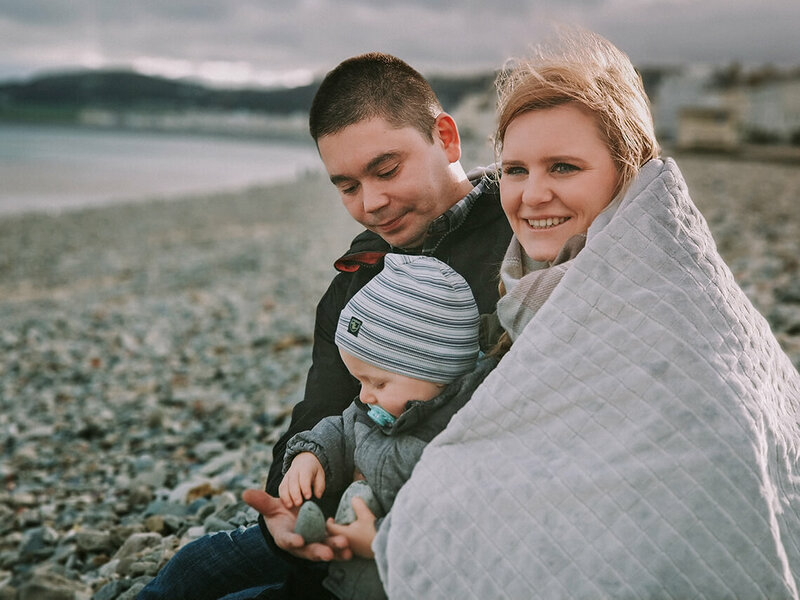 Klaudia’s mother immediately asked is the weighted blanket could be used, and as she recalls, it appeared that these seizures stopped the moment the weighted blanket was placed on Klaudia. Do you use weighted blankets often? What are its effects?